The biggest HCH event of the year is just around the corner and that is the Open House. 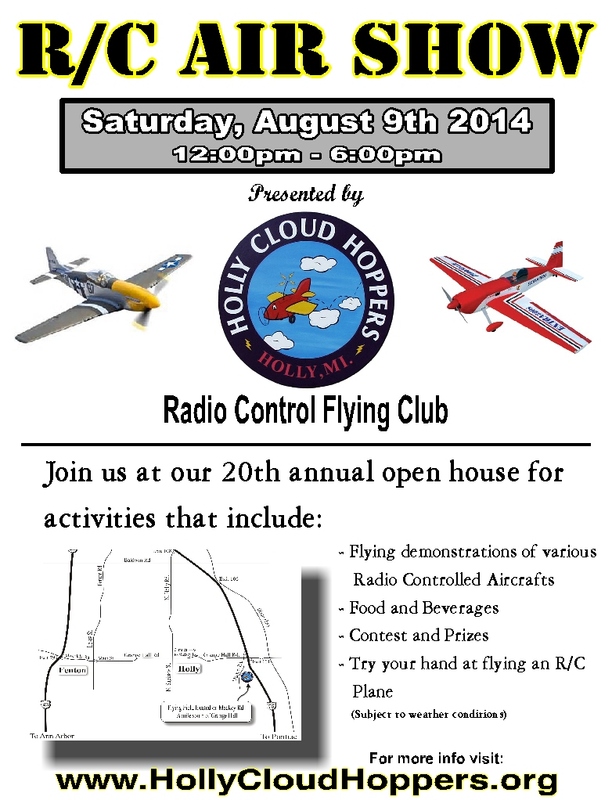 For the past couple decades this annual one day event has showcased radio controlled flight to the local community. Not only has the Open House been a way for the public to witness skilled modelers flying various types of aircraft, the club has also provided an opportunity for non-modelers try their hand at flying a plane. Because of this the Open House has brought several people into the hobby. The plan this year is to hold the Open House with all the same traditions but with one alteration. Instead of holding it on the traditional first Saturday in August, this popular event has been moved to the second Saturday. This was done to as to not conflict with another popular R/C event hosted by the Flint Aero Club known as the Big Bird Fly-in held the first weekend of August.